Maintaining security of supply whilst integrating large quantities of renewable energy is the main challenge for the future European power grid. System stability and reliability are therefore of the utmost importance. The two EU funded ‘Horizon 2020’ projects MIGRATE and PROMOTioN are investigating these future challenges to power grids, both on- and offshore, and provide solutions and recommendations on how to shape the energy future of Europe. 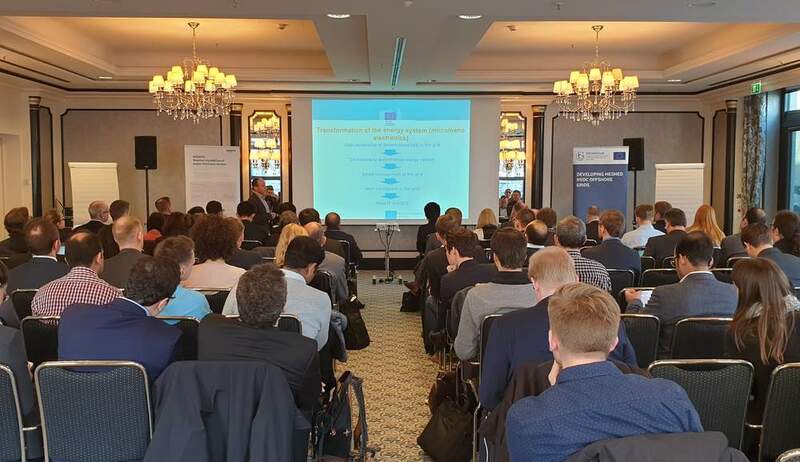 Both project consortia hosted a joint workshop on 28 February in Berlin to discuss complementarities and synergies between the two projects. The event focused on changes in system inertia, control and operation of no or low inertia grids, power quality issues as well as recommendations regulation and grid codes. Peter Vaessen, Professor at the TU Delft and working for the project coordinator of PROMOTioN, DNV GL, moderated the event. Mario Dionisio, from the European Commission’s Energy Department, gave an introductory presentation about the EU energy policy context and how power electronics, dealt within the two projects, impact the energy domain. The experts of MIGRATE and PROMOTioN elaborated on the current state of research of both projects, while discussions between the presentations helped to gain a better understanding of the complementarity of the research. The audience, consisting of around 80 experts from different technical fields, were asked multiple times to state expectations towards the workshop and, at the same time, work hands-on on a better understanding of the overall problem. There was a broad consensus among the attendees that the research of both project is leading to the utilisation valuable synergies. While the operational experiences are still limited, the projects proof the feasibility of the technologies and provide different perspectives on the same challenges. This will ultimately lead to a better understanding and increased integration of power electronics in the overall system. Aside from the technical challenges involved, the attendees agreed that a sound regulatory framework and standardization will accelerate the development of power electronics towards more secure and reliable power grids.